A native of Sligo, Noel qualified in 1983 after graduating with a BCL Degree with first class honours from UCD. He has practised all his professional life with Kelly & Ryan. He has an interest in all areas of law and has acted in the past for a wide variety and diversity of clients. He has acted in the past for such specialist bodies as the Sligo Harbour Commissioners (before their recent abolition) the North West Regional Fisheries Board as well as for local businesses and companies. 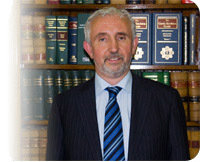 He has a large Private Client base and has considerable experience and expertise in dealing with every day transactions such as accident claims, buying and selling all types of property, preparation of Wills, administering estates, representing parties before tribunals and at arbitrations as well as in all courts.